In my twenty years of life, I’ve never come to Sumatra. But in April 2018, Lampung has been the first place I’ve ever visited. Specifically, Pahawang Island. 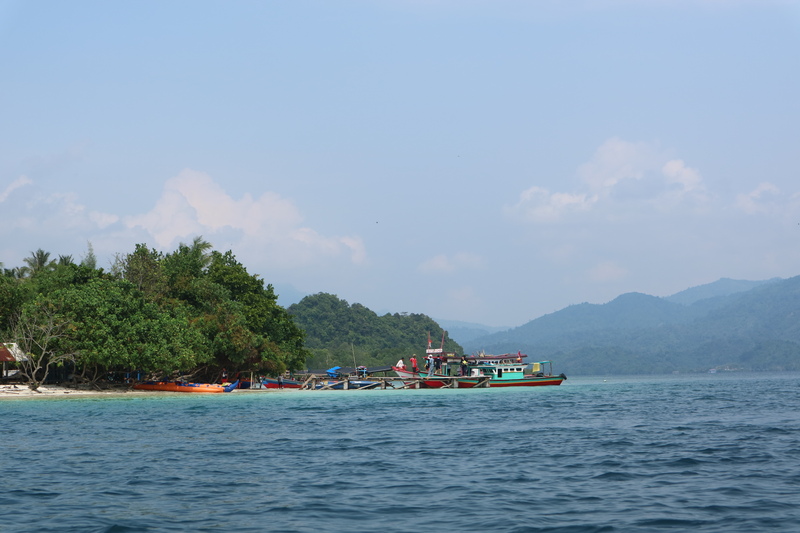 Pahawang is an island that located in the District of Punduh Padada, Pasawaran district, South Lampung. This island is often said to be a paradise for snorkelers because of the beauty of its underwater biota. My father’s office made a trip to Pahawang by bus from Jakarta. We went to Port of Merak at 12.00 AM then continued the travel with ship to Port of Bakauheni, it took about three hours to small port before go to the island with boat. I woke up when the bus was already on the parking lot, I opened my eyes, its felt warm because the sun shining on my face, came from the window. I got off from the bus and could felt the sand of the beach in my feet; white, soft, and hot such as the weather. From the bus stop, I walked to the beach with my little sister, looking around, there were coconut trees along the way. The blow of the wind made its leaves dance, also pulled our clothes back. Then, there were many small shop which sell food and beverages. Small souvenirs shop also available there, a shirt with a writing of Pahawang hang over the shop, the seller let it blown by the wind. When we arrived at the small port, the boats were waiting for us, the drivers sat near their own boat, ready to take us exploring the island. When the times came, I stepped my feet to the seashore, a little closer to the boat I was going to ride. My left foot touched the water while my right foot started to go on the boat with the little wooden stairs. The water was clear and cold, the wooden stairs was fragile so I hold it tight. After all the passengers were ready, the driver started the engine. The serenity replaced by the sound of the engine. It’s very loud and noisy. Blue and green filled the scenery along the way, the smell of the sea, the fresh air. The first stop was the snorkeling spot, it was called Nemo Park. When arrived, the noisy sound of the engine was gone, there were three boat including mine surrounding the snorkeling spot. I could feel the calm of the sea by the little soundless waves. I was not sure I would do snorkeling because I admitted that I was coward. But at that time, my curiosity was bigger than my fear.So I decided to make this as my first time of snorkeling. I wore the life vest, a diving mask, swimfins, and a curved plastic tube for breathing. My heart beats faster. I was nervous, I was afraid because my feet would not touch the bottom, I could not imagine how my body could floating on water, meanwhile I could not swim well. Looked around; the wide sea, the crags, and other boats. My brother and my father were already in the water, enjoyed the sea and fishes. I finally went down the boat stairs, when my whole body already in the water, I took off the tight grip from the stairs. I was shocked. I knew I could not touch the bottom but unconsciously my feet were searching for anything that could be the foot step. I should not be panic, made it getting worse. I tried my best to calm down, tried to at least make my body to stop moving. After that, my first attempt was swim to where my father is. I pushed my body and reached my father’s hand. He showed me how to be calm and how to snorkeling. I set my body to the right position, lifting my legs parallel to my body, letting my body float. I closed my eyes and put my head into the water, let it sink to about mid-forehead depth. That cold water touched my face, I opened my eyes looked into the sea, breath in cautiously, made a bubbling gurgling sound, a sign that I able to get a full breath in. Moving my eyes up and down, left and right, I was amazed, felt like I was here in the big aquarium. It was incredible and colourful sea world. There were various types of fish I’ve never seen before, with striking colours and shades, striped, in varied sizes and shapes. A group of fish moved forward and back, made the same move. The coral in many colours, shapes, and textures. Lived peacefully together also with the other sea creatures in the fabulous blue world. They said that was Nemo Park, but I could not found it at first, I moved forward, and finally found a friend of Nemo, that is Dory, a blue tang fish. I moved left, an orange and white stripped fish playing on the coral, it looked familiar, Nemo was there. There was a rare experience offers, dive for a few seconds into the deeper sea then there will be a photographer captured you with the clown fish. But I was scared so only my brother did that. Other than that, my dread was replaced with the excitement. I moved here and there, looking the moving fish, the dancing coral. I lifted my head up, looked at everyone’s happy faces, the silent boats around us, also the crags. When the time was over, I went up to the boat. Right when I was on the boat, my left foot cramped for few minutes. The boat continued move to the little island, the place where we had our lunch. The island was more like a common living place. Several house lined up, facing the sea. The food was already on the table, there were fresh grilled squid, shrimp, fish, and of course chili as a complement. The taste was both fresh and delicious. Not only that, after we had the delicious seafood, we continued to snorkeling again in different spot. There was no significant difference between the first and the second spot, the sea was clear, various types of fish and beautiful coral. Until one moment, my sister pulled my hand then showed me a familiar creatures but we never saw it this close, like moving to the upwards but not to the surface of the sea. It looked simple yet transparent. It had umbrella-shaped bells and trailing tentacles. It was jellyfish. We cannot move any closer because it was dangerous. I was surprised enough to see the jellyfish around us. Did not want the moment to end, but I had to swim to the stairs, the time forced us to end the snorkeling. The next day, I went out from the bedroom to have a breakfast, the place was in front of the cottage, like house on stilts, we could saw fishes passing by from the very clear water. After had a breakfast, my brother, sister, and I walked to the beach, stood up at the seashore, letting the water gently lap on my feet. I still could clearly see my feet while the water was there. Our journey continued to another small island, I fell in love when the boat takes us to any places, even the noisy sound of the engine disturbing the sound of the waves, I love to look around. The crag, the crystal clear seawater, the colour gradation of the high seas, touched the splash of water because of the boat, the sun toasted our skin. One of the sounds that can beat the noisy engine was when the waves were crawling to the crags, it made a loud crash sound.